All action-movie heroes are superhuman, because they do the impossible, and usually do it alone. The quality of an action movie, then, comes down to how believably these men and women can achieve unbelievable things. By this measure, The Black Pirate is a success. 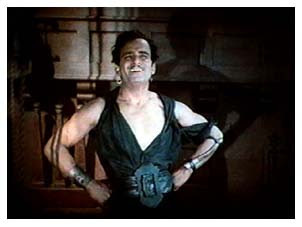 Its star, Douglas Fairbanks, does it all, and because he is Fairbanks: athlete, lover, fighter, thinker, we always buy it. There is, however, one thing even he cannot do, and that’s carry scenes he isn’t in. And unfortunately for us, there’s a few too many of those in The Black Pirate. Fairbanks’ floating epic is set in the 18th Century, when the waves ’round merchant ships churned red from the merciless depredations of pirate vessels and their crews of scurvy dogs. Take heed, wealthy men, for the sea’s waitin’ to put a chill in yer bones, if ye dare to resist ’em. Watch for their black standard, and be ye a fool if these pirates don’t look to thee like the pirates they surely are. Arr. The Black Pirate’s pirates stand out, having visited a costume shop prior to shooting and bedecked themselves in trademark pirate-wear, including eye-patches, peg legs and parrots. The first ship this barnacled lot attacks includes Fairbanks among its passengers, along with his father. The two men are the only survivors of the pirate’s pillage, though dad doesn’t live long. This causes Fairbanks (as yet unnamed in the film) to vow vengeance upon the murderers. But he’ll do it his way. I said action heroes were superhuman, but Fairbanks reminds us that there’s more to it. His characters, despite their warrior gifts, are a different species than the killing machines brought to life by Schwarzenegger, Stallone, et al. Those bad asses are the Achilles and Sampson of their day—near-invulnerable beings who, though they may be cunning, get by primarily by being better fighters than anyone else. Fairbanks draws more from the trickster tradition—the Hanumans, the Josephs; even Odysseus. For these men, physical prowess is secondary to brains. 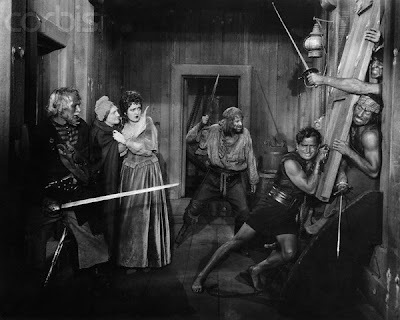 Disguise, distraction, and slight of hand were the trickster’s means of survival, and so they are for Fairbanks, who, as the self-proclaimed ‘Black Pirate’, decides to avenge himself upon the pirates first by infiltrating them, and then, by leading them to capture. Fairbanks wastes little time in dispatching the pirate captain. But to really win the hearts and minds of the motley crew, he must dazzle them. So he makes a boast: he will capture an entire merchant ship by himself. The pirates, having already seen him defeat their best fighter, almost hope he succeeds, though they don’t quite have the faith. We do, but we know Mr. Fairbanks a lot better. The single-handed capture of the merchant ship is the best scene in The Black Pirate. It begins with Fairbanks floating by the ship in a tiny boat, disguised as a fisherman. Once out of sight, he climbs onto the ship’s anchor, then performs several feats of gymnastics to scale its stern. Fairbanks keeps climbing, like a spider monkey, until he reaches the heights of the rigging. From there, he’s able to return to the deck by sticking his dagger in a sail and letting his weight tear him a slow descent. His guile and confidence allow him to herd the crew into submission with their own weapons. Fairbanks is magnificent, and the pirates are impressed. This scene felt wondrous to me, and it came not from a fear that Fairbanks could fail, but instead, from the anticipation of seeing how he would accomplish this impossible feat. For it is a feat, just as a circus strongman performs a feat when he lifts an enormous amount of weight. First he shows us the weight, then we marvel at the challenge of it. But we hardly paid to see him fail. We’d actually be shocked if he did. Fairbanks is an exuberant lead, and his presence makes The Black Pirate feel buoyant and joyously free. The film seems capable of anything when we’re watching him in it—as limitless as the sea it’s filmed upon. But The Black Pirate can also be a still film, with a plot that drifts and bobs along, without no hint of breeze to propel it. We first start to feel this about halfway through the second act. That’s about when the trickster’s games catch up with him, and Fairbanks is forced to walk the plank. We all know he’ll survive the drop, but The Black Pirate itself barely does. Without its star, the film isn’t too sea-worthy. The supporting cast is partly to blame for this. During Fairbanks’ absence, his plans must be kept afloat by his comrade, the good-hearted pirate and would-be highlander, MacTavish (Donald Crisp). MacTavish is strictly comic relief, and we know damn well he’s not going to accomplish anything important while Fairbanks is away. Worse is Fairbanks’ story-mandated love interest, Princess Isobel (Billie Dove). Dove, a veteran with more than 20 films under her belt before 1926, is so stiff in The Black Pirate that she could have substituted a wax double in most of her scenes. Her response to everything is a frozen pose and forlorn look. She both overacts and underacts, allowing no moment when her jeopardy might cause us to fear for her. The Black Pirate needed a stronger Isobel, because only her endangerment can bring the weight of serious drama. Fairbanks’ can’t. A smile is never far from his face—even in the thick of combat he has a glint in his eye, facing every foe with doubled-fists and a thrust-out chest. He’s all about the joy of adventure, whereas Isobel, if we cared about her, would be about its consequences. The villains, too, are lifeless. Opposing MacTavish is the dastardly Pirate Lieutenant (Sam De Grasse), whose machinations sent Fairbanks off the plank in the first place, and who, in a different Fairbanks film, would have been second-in-line to the throne of something. He skulks, and schemes, but mostly, he waits. Just like we do. As for the rest of the pirates, they’re done in by a combination of deliberately comic editing and the silent medium itself. Take the early scene where the pirate captain, not yet ousted, has the crew of a captured vessel tied together, beaten and robbed. One holdout, seeing his comrades’ valuables pouring into the pirates’ bags, decides to swallow his valuable jewelled ring. The captain witnesses this, unholsters his knife, hands it to a subordinate and orders him to retrieve the ring. You can guess how that gets done. But the scene isn’t horrible at all—it’s funny, since the camera stays on the pirate, never cutting (ha) to the victim. Nor can we hear the victim’s screams of pain, because the film is silent. This gallows humour is intentional, I’m sure. But it leaves us with a film that is finally too light. 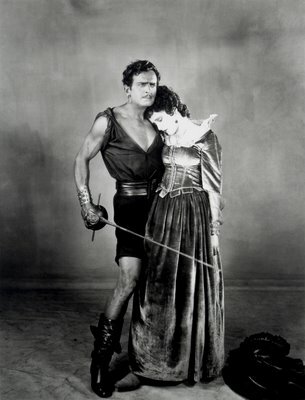 Even Douglas Fairbanks—hero, lover, warrior, clever pirate—can’t handle everything himself. Without a good cast, he too is sunk. Kino International distributes The Black Pirate on DVD. However, I had the pleasure of seeing this film live (in two-strip Technicolor), as part of the Toronto Silent Film Festival. Many thanks to Shirley Hughes and her colleagues for organizing this event, and to the Toronto Film Society for its support. The Black Pirate was accompanied by Laura Silberberg, who proved her chops (and her stamina) with 90-plus minutes of improvised piano playing. I haven't seen this - though Douglas Fairbanks is an actor I need to watch more of. But upon seeing the title and the date I though that maybe it was an incredibly racist movie... thank god its not!